Cinema, look upon your future king. The man you see above — whose head is so full of important thoughts that he has to prop it up at all times with a spare hand — is Douglas Booth, the 21-year-old star of Julian Fellowes’s upcoming big-screen adaptation of Romeo & Juliet. Booth recently spoke to the Evening Standard about his blossoming career, and the resulting profile (published in last weekend’s ES Magazine) was puffier than Sean Combs. He goes on to explain that, “five days is the extent of my modelling career, compared to the years I’ve spent slaving on a film set”. 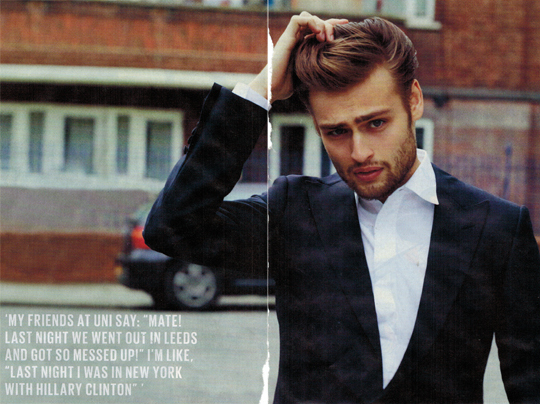 To date, Douglas Booth’s resumé lists five films, if you include two TV movies, the unreleased Hunters of the Kahri and the Miley Cyrus vehicle LOL. FYI — if you’re thinking of joining the corset crew, bear in mind that eggs royale at the Wolseley will set you back £14.50. That’s Douglas Booth, star of LOL, talking about Olivier Award winner, 4-time BAFTA nominee, and star of Peter Jackson’s $560-million dollar Hobbit franchise, Benedict Cumberbatch. Nice of him to keep his old friends in the loop even after their paths have diverged. Help set that day back a little further by not seeing Romeo & Juliet, in cinemas this Friday.